Specialty Outpatient Programs at Hotel Dieu Shaver cover a range of services, including an Adult Seating, Ambulatory Rehab, and Geriatric Rehab. Customized seating solutions are required by many individuals throughout the Niagara Region who are living with complex physical disabilities. Seating plays a critical role in maintaining an individual's positioning, which in turn maintains a person's health (e.g., skin integrity, respiratory health, and physical mobility). The Adult Seating Clinic provides specialized, interprofessional rehabilitation expertise, helping patients to be mobile, engage in daily living, and optimize their quality of life. "A structured rehabilitation program for individuals 65 years or older with balance and/or mobility impairments." A referral from a physician is required. Participants are assessed individually by a physiotherapist and participate in group therapy, individual therapy, and group education topics relevant to Falls Prevention. The duration of each session is 6 weeks, three times weekly. There are approximately six sessions per year. The Memory Clinic is a specialty clinic dedicated to helping patients with memory difficulties. An interdisciplinary team will assess and provide recommendations on many aspects of memory function. 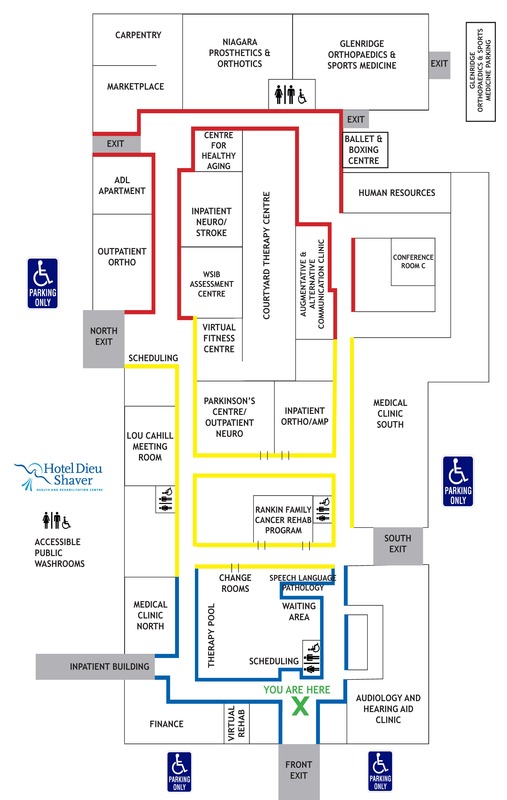 Hotel Dieu Shaver's goal is to help patients with memory difficulties maintain independent living and best quality of life for as long as possible. Telemedicine uses telecommunications technology to provide clinical health care in Ontario at a distance. This helps improve access to medical services that often would not be available consistently in distant rural communities. Patients that use our services at HDS do not have to travel to their appointments in Toronto and elsewhere, they see their physician/consultant in real time on camera.